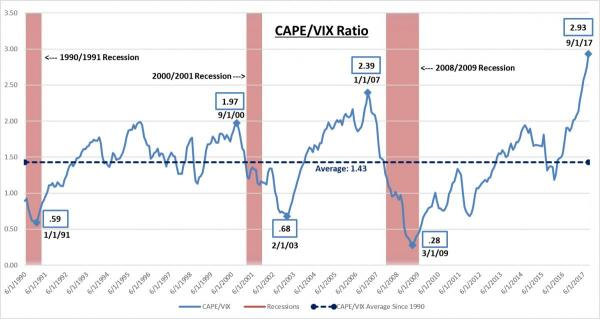 "Untethered optimism can be seen most clearly by looking at the relationship between the VIX and the CAPE ratio. Over the past 27 years, this figure has averaged 1.43. But just this month, the ratio approached 3 for the first time on record, increasing 100% in just a year and a half. This means that the gap between how expensive stocks have become and how little this increase concerns investors has never been wider. But history has shown that bad things can happen after periods in which fear takes a back seat."